The Cressi Patrol BCD is light weight travel style that is perfect for travelling divers who need to save on weight and luggage space. Recreational divers also love this BCD even if they are not travelling as it has an extremely free feeling when wearing it compared to a a full inflating BCD where you can feel a little restricted. This rear inflation style bladder allows you to have a more streamline silhouette which is great for cave or wreck diving. The weight integrated pocket mean that you can wear all of the lead weight in the pockets to eliminate those old horrid weight belts that constintatly twist and turn. With a simple pull, you can release the weight pockets if needed in an emergency. 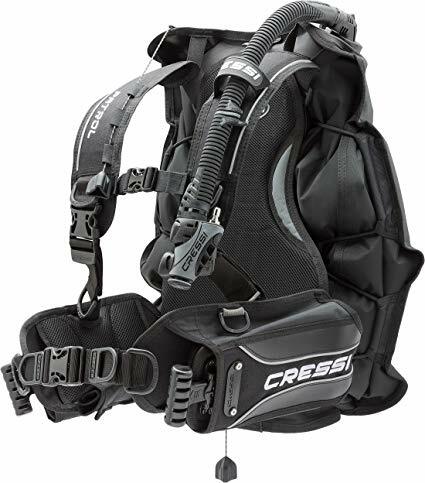 The Cressi Patrol BCD has a very cool feature which most other styles do not have and that is the adjustable shoulder harness system. This means that you can get the best possible fit as you can fully adjust it to fit your body shape. Lets say to need a size Large but you have a very short torso, a standard lare would sit very low under your waist, where as the Patrol can be shortened to fit your short torso. Perfect! There is a hide away pocket for any accessories that you may need to keep on you. Padded nicely allows this BCD to be a great choice when looking for your new or next BCD.